We started with the calamari, which had its good and bad points. The tentacles were a little stringy, but the breading was excellent. Overall it had good flavor, but the dipping sauce was nothing to brag about. 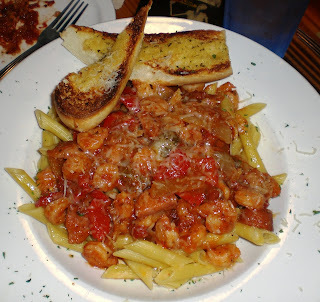 I had the Pasta-laya, which was TONS of shrimp, some sausage, peppers, and onions on penne. The penne was a tad undercooked, and the sauce was really greasy, but the flavor was wonderful and I thought that the accompanying bread was good. Kasey, not being a big seafood person, went with a burger and fries, which he finished before anyone else was even half-way, so I guess it was delicious, LoL. Michele and Jonathan both ordered the exact same thing: Big Daddy Feast: pick your flavor and get a bucket full of stuff flavored with it. It had Dungeness crab, king crab, snow crab, an ear of corn, a couple of red potatoes, and it came with a cup of liquid butter. They also had a side of Old Bay brought out, since that was the flavor that they had both chosen and felt it could have used a little more. They both thought it was good. Personally, the amount of time and effort involved would drive me crazy, but since crab is one food I don't care for, I may be biased, LoL. I love Joe's! The Crab pots are the best thing...but you have to like crab!